Moonwalk Events Management Private Limited is an event management company specialized in organizing sports events, corporate events, family events, promotional and marketing events in India. 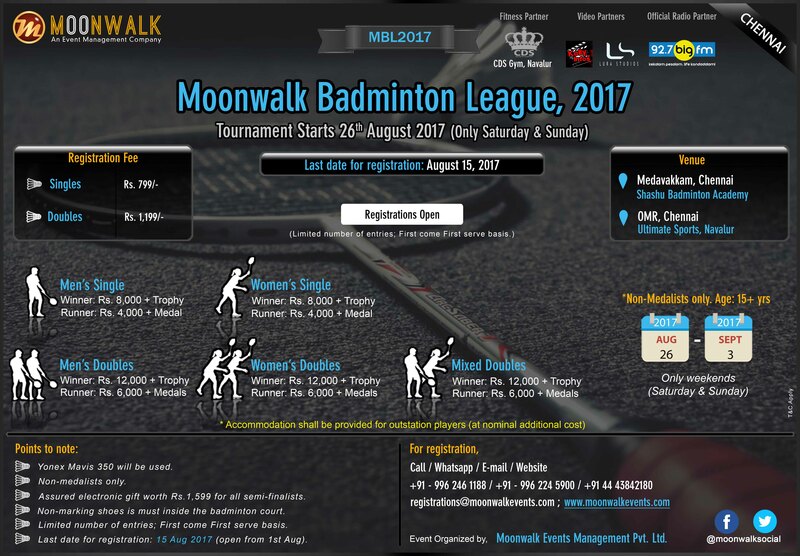 MBL2017 is a annual badminton tournament organized by Moonwalk Events Management Pvt. Ltd., in Chennai. Non-medalists only. All players above 15+ yrs age are welcome to participate. Last date for registration: 15 Aug 2017. Limited entries only, on first come first serve basis. Register before the entries get over. This sporting event starts on 26th Aug 2017 (only Saturday & Sunday). Please contact us @ 996 246 1188 / 044 43842180 for more details.